One of the AR1000 Turbines to be deployed at the Pentland Firth site. The largest tidal energy project in Europe has been granted permission by the Scottish Government. 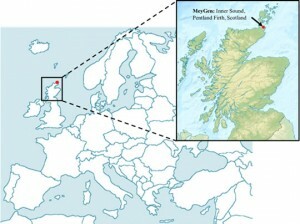 MeyGen Ltd., a joint venture between American investment bank Morgan Stanley, French independent power generator International Power and Australian tidal technology provider Atlantis Resources Corporation, has been awarded consent for an 86MW array, following the completion of the statutory approval process with regulators. The project is located in the Inner Sound of the Pentland Firth off the north coast of Caithness, home to one of Europe’s greatest tidal resources and among the most valuable in the world for tidal and wave power. The firm has agreed a 25-year lease with the Crown Estate for an area of 1.4 square miles (3.5 square kilometres) between the island of Stroma and the north easterly tip of the Scottish mainland. The scheme, which will be the first commercial deployment of tidal turbines in Scottish waters, will see an initial demonstration array of up to six turbines, with construction starting in early 2014 and turbines commissioned in 2015. Each turbine, standing 22.5m (73ft) tall and with a rotor diameter of 18m (59ft), weighs 1,500 tonnes and could generate up to 1MW of power. Using a ‘deploy and monitor strategy’, the initial array deployed in the first two years will provide information on the interactions between the array and the environment and increase the understanding for subsequent phases. Phase 1, approved by Scottish energy minister Fergus Ewing, will be completed by 2020 and consist of a maximum of 86 turbines, enough to power over 40,000 homes – about 40% of homes in the Highlands. Phase 2 will be subject to a separate consent application, MeyGen hopes the site will eventually host up to 400 submerged turbines, generating up to 398MW. These news could not come at a more apt time for the UK. After years of trial-and-error experimentation (see this article of mine from 2010), the tidal industry is finally entering its commercial phase at a moment when new power generation in the country is most needed: several old, centralised power stations (coal and nuclear powered) are due to cease operations within this decade, and even if the much trumpeted new nuclear fleet of French EPR reactors were to finally be built (an unlikely event given that no private company will commit to this if no subsidies are granted), Britain would not be fed any of their electricity in time for this phase out. Chances are, instead, that a new fleet of modern gas powered plants will have to fill a large share of the gap in the years to come, partly spurred by the dubious shale gas rush being unashemedly advertised by the UK government, and mostly to be backed up by Russian conventional gas. In the long term, the coming tidal technologies could prove very helpful in achieving UK’s low carbon targets, by eventually providing up to 15-20% of the country’s electricity. That is, if steady progress is achieved in the near future. In the meantime, other more mature renewable energy technologies are starting to fill the gap on their own, at a pace that was not conceivable only a few years ago. Offshore wind power has come of age, with several huge projects under construction or already feeding the grid (like the flagship 1000MW London Array, just to mention one), which have helped boosting UK’s installed wind capacity to over 10GW this year, with projected installations of around 30GW by 2020. Even distributed solar power is starting to make a dent in the UK energy sector: now a multi-GW player – the 3GW mark is being reached these days, with a potential of 10-15GW by 2020 – , solar photovoltaics are already at grid parity in southern England, something that few people thought possible only three years ago (I will discuss this in a separate article). If the relentless development of wind and solar power can offer us any clue, marine power technologies now look set to give their fair contribution to our energy mix in a not so distant future. This entry was posted in Clean Energy, Water. Bookmark the permalink.